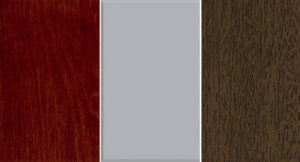 Once you choose the wood garage door style you like, it’s time to choose the color. But then you are faced with one more difficult question: which wood garage door coating option to go for! The truth is that there are some differences between the three garage door coating methods. Although they all add charm and elegance by finishing the garage door beautifully, each is chosen for a different reason while their maintenance requirements differ too. So, let us take a closer look at these options and help you decide if it would be best for you to stain, faux stain, or paint your garage door. 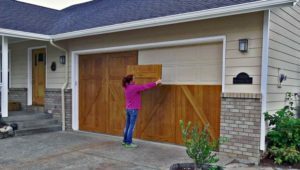 Do you have a paint-grade or stain-grade wood garage door? One of the factors, which determine the coating method of wood garage doors is the material. Carriage house garage doors are either stain-grade or paint-grade and here are their main differences. These types of carriage house doors can be either stained or painted. And so you are given two choices. On the other hand, they are more expensive than their paint-grade counterparts and need more maintenance too. The end finishing result is great although dark hues are not recommended since they easily break down while the garage doors demand a minimum of two coatings. Paint-grade doors are easier to maintain and cost less than stain-grade ones but they can only be painted (not stained). It’s best to prime the surface before painting while it takes two coats of latex paint to get great results. Once more, dark colors are not recommended since the wood might crack under high heat. Garage doors must be sanded before stained, especially if there are scratches or other imperfections. The good news is that there is a range of colors that bring out the natural charm of wood. Now, if the garage door does not have a classic wood tone but there are pink or reddish undertones, it’s best to use a faux-stain. These types of paints are used when you want a finish that imitates oak, cherry, mahogany or any other of wood species. It’s a great option for rather colorful woods that won’t benefit from a simple stain or when you like to refresh vinyl or metal garage doors with a wood-like finish. You can paint any wood or composite garage door in any color you like keeping in mind that the lighter colors remain intact during hot days with proper maintenance. It’s important to make sure your primer and the coating are compatible. Garage door companies usually recommend acrylic latex based paints to finish over a latex based primer. If you prefer oil based paints, it’s best to use oil based primers too. 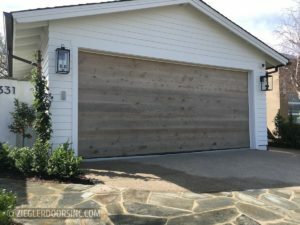 In short, start by finding out which type of wood garage door you have or decide which one you want to buy – that’s if you are planning a fresh garage door installation. This will be the first step to deciding which coating method to choose too.